I asked Melissa to send me a picture from home, so here it is. She took down all of Christina's pictures and put up ones of herself. Just kidding! She says she is doing well, but we all know that she is missing us just as much as we miss her. God bless you Melissa, keep going strong for the Lord. Mihokosan's birthday was Friday and Josh's was March 16th. People brought a lot of cakes tonight, so at w2 we had a cake frenzy! Look at the size of Mihoko's cake. Well it really was not a cake, but it was Banana Nut bread, it was huge! It was a real joy celebrating the birthdays last night. This Ramen resturant in Okinawa is famous for it Oishii (delicious) Ramen! It is absolutely delicious! After church Sunday afternoon a group of us went for lunch. You order by putting your money into the machine and picking your dish. You give it to the waiter and they bring out your Ramen. They give you tasty side dishes to eat with the main course. It was an afternoon of fun. It was a real blessing being able to share the Love of Jesus Christ out at Mihama. Since Teresa has been teaching us Hula, we shared it on the streets. While people came by we passed out tracts and shared our faith. Thank you again Teresa for a wonderful time, we cannot wait until we visit you and when you come back. God bless you. It is great to see this good lookin guy. Jesse is doing wonderful on the campus at CCBC Murrieta. For all of us in Okinawa we truly miss this guy, BUT wait a minute! Jesse is seriously thinking about return to Okinawa. The planets are all beginning to align back into orbit. Please pray for our brother as the Lord is speaking to his heart about attending his third semester back here in Japan. May the Lord continue to lead and guide you brother. Captain Billy is a Christian man who owns a charter boat out in Naha City. He rents out his services for anyone who wants to go on a fishing excursion. Well Nate and a few of his Marine buddies went out for a day on the ocean. He said the water was absolutely "smooth as glass". A great day to be on the water. They caught a lot of fish. They even caught a Marlin that day. Sorry I do not have a picture, he only had video. Why is Nate so startled? Maybe he thought the fish was going to bite him. Friday mornings in the Bible College we spend time watching a teaching on ministry. This week, we had the privelege of seeing Pastor John Bonner from Lima, Peru. He is the director of the Bible College in that area. It was a real refreshing time, hearing from the Lord. Nate went deep sea fishing the other day and brought us back some good yellow fin tuna. We spent some time filleting the fish in front of the house. Thanks a lot Nate for the fish, we are so blessed. Praise the Lord our brother is back on island. Josh has been gone for over two months as the Marine Corps has him serving in different areas around Asia. We stopped by his house tonight to say hi to our brother who we have missed so much. It is great to have you back bro. God bless you! Teresa from Ishigaki Island is back again for the Hula Outreach in Okinawa. Thursday and Friday she is teaching us "Gospel Hula". On Saturday morning we will be doing an outreach in Ginowan Park, and Saturday night we will be sharing the Gospel through Hula at Mihama. Please pray for us that the Message of the Cross will be shared with the people here in Okinawa. The team has been busy out on the streets of Okinawa, but today they are preparing for some opportunities to minister at some local churches. It was a good time to take them out to get some local Okinawan food. We went to a real famous Okonomiyaki restaurant in Ginowan city. It is located real close to the college. They really liked this style of food. Sayuri was a professional cake decorator and she baked this cake for our Anniversary. It was so oishii (delicious). I came home from the Acts Bible Class and was greeted with this wonderful cake. Thank you Sayurisan, we are so blessed. Melissa is heading to California, via Tokyo, via San Francisco. The most interesting thing is that she will arrive in California before she left. On the way to Okinawa she lost a day, but going back she gains the day back. Interesting isn't it. Well, again girl, thank you for all the blessings and the fun times, please say hello to your sisters and your Dad. Make sure that the fire for the Lord continues to burn bright for Him. Love, your family here in Okinawa. It is really sad to see Melissa leave Okinawa. She has been a blessing to many of us here. She always cracked us up with some of the things that she said. She did such a great job in the Evangelism class, we are going to miss her greatly. Thank you Melissa for coming to Okinawa and for being such a blessing, please keep in touch with us all. We love you! Satsukosan and Atsukosan came over our house today and cooked a traditional Sukiyaki dinner for the Bible College Students. The food was out of this world! It was so tasty! As you can see, sukiyaki is cooked in a pan adding all kinds of vegtables and beef. There were four different cooking stations with the students at each station. As the food cooked, we chowed down! Also, when you eat Sukiyaki after it comes out of the pan boiling hot, you dip the meat into a small dish containing raw egg. Cho Oshii! (Totally delicious). Thank you gals for coming over our house and blessing us all with this wonderful meal, we are so grateful. Tonight we celebrated Aika's21st birthday. We would have been at the beach, but because of the rain we cancelled the "Tropical Beach Bento Baptism Bash" until two more weeks. So, one of the gals brought a cake for Aika, and we celebrated together. 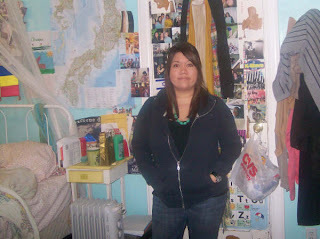 For those of you who do not know Aika, she is a sweet Christian gal who attends w2 regularly. She is a blessing to all of us. When you get a chance, please leave her a Birthday greeting below. Easter morning we were invited to the Sunrise Service at Camp Foster. So we headed out the door at 5am to get ready for the service. Two church groups gathered together that morning, the Protestant service and the Gospel service. The special music given by the Gospel choir was out of this world, simply awesome. Afterwards we went to the Globe and Anchor and had a buffet breakfast. The kids got together and made this video for us. It covers the 22 years that we have been married. We were blessed. These years together serving Jesus, we could not ask for more. It was such a blessing to worship the Lord at the Public beach here in Okinawa. We rented out Araha beach for the "Sambi Fest" (worship Festival). We had 6 different bands come out and lead us in worship. It was a great night as we lifted up the Name of Jesus. Today we celebrate 22 years of wonderful marriage. It is such a blessing to be married to such a great wife. 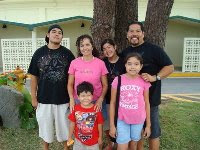 Here we are serving the Lord in Okinawa Japan with our four children. We do not know what the Lord has in store for us, but we know that it is good. God is good! Ps. 84:11b "No good thing will He withhold from those who walk uprightly. The day was beautiful and the set up was so easy. We actually build the movie screen right there on site. It came out perfect! You can see the beautiful scenery in the background, the beach is right there! The guys had a great time practicing for the evening event. Friday night we hosted our Good Friday Service outside at Araha Beach. It was such a blessing! First of all the weather was perfect! It has been raining off and on all week, but Friday the weather was beautiful. We had a few of the guys lead in worship and Hakugaijin did a little rap performance for us. When it came time for the movie everyone was blown away. The movie projected perfectly and the sound was theatre quality. Pastor Tim did a wonderful job proclaiming the salvation message and Ayu translated perfectly. The people were truly blessed and touched by the powerful message in the movie. The Name of Jesus was proclaimed at Araha Beach!